How to assign students to case study roles over the course of a semester such that they would not be assigned to the same group more often than necessary. User Accounts – New users can register, sign in, retrieve an assignement or view existing assignments, change their password. Existing users access the system at different levels depending on their user type permissions. Assignment Generator – We wrote a custom algorithm to randomly assign the first grouping of students and then calculate the optimal subsequent quasi-random groupings to ensure that students were paired a minimum number of times with the same groups throughout the semester. Assignment Notification System – Emails are sent out to students once the professor is ready to send. 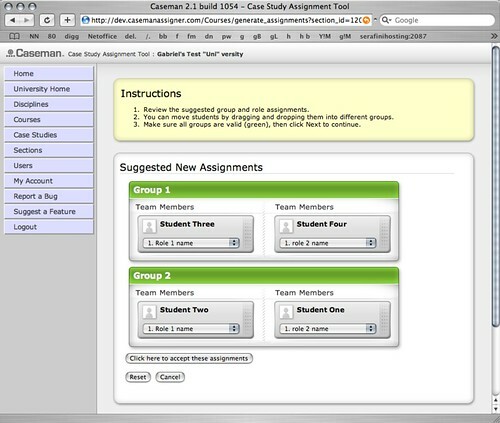 Professor can customize the email for each individual assignment. Assignment Materials Upload – Professors and application administrators can upload materials to the system. As part of the upload process, title, description and relationships are established to associate case studies with courses that professors have access to. Secure Viewing of PDFs – Students are only allowed to view each assignment a limited number of times (implemented at the request of the graduate program supplying the materials). After their view count runs out, a professor can reset the student’s ability to view their assignment. 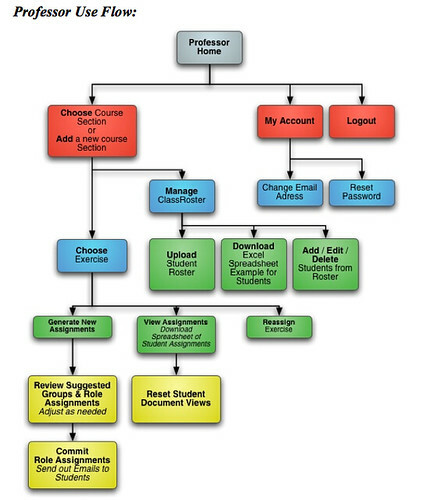 This diagram represents the 2.0 version useflow for the Professor user type. We used an object-oriented PHP approach with a MySQL database backend for speed and flexibility. The application is currently at version 2.2 and will be going through another round of feature enhancements to further improve the user experience and deliver new features that the client has requested.